The deadly tornadoes that whipped through the DFW area in late December destroyed everything in their path. Many homes were destroyed, property was damaged, people were injured, and some lives were lost. In the wake of this tragedy, many DFW residents are showing their support by donating and volunteering to those in need. The cities surrounding the affected areas created clearing houses for volunteers and residents. 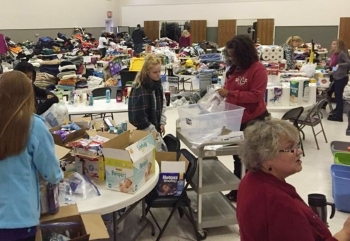 So many people in the area donated items that the town of Garland tweeted it couldn’t accept any more donations at its three school drop off locations! Volunteers passed out the donations, which included clothing, blankets, bottled water, toiletries, towels, and other items last week. Additionally, many businesses, both national and local have been stepping up to help. American Airlines pledged $100,000 to the local American Red Cross Chapter, 24 Hour Fitness opened its doors to tornado victims, and Legacy ER & Urgent Care set up donation boxes at its seven North Texas locations to collect goods. If you were in the affected areas and still haven’t let your family know you’re safe, you can through the Red Cross “safe and well” site. You can also search for a loved one to see if they are safe as well. If you’ve lost property in the storm, or found someone elses sentimental items, the Dallas Morning News has created a resource to help connect people with their items. You can visit that site here. Additionally, people searching for lost pets can use the resources here and here.